You are currently browsing the tag archive for the ‘school’ tag. The world is ever changing. Some organisms are incapable of changing their habitat or behavior to adapt to this mutability, whereas other animals are always doing unexpected things. Among the latter are Humboldt squid (Dosidicus gigas) large aggressive cephalopods which are always popping up in unexpected locations. These squid usually live in the open ocean at water depths between 200 & 700 m (660 to 2,300 feet) however they are apparently capable of swimming higher or lower. Similarly although they used to live predominantly in the Humboldt Current (which runs from Tierra del Fuego up through Central America), it seems they are now migrating north. 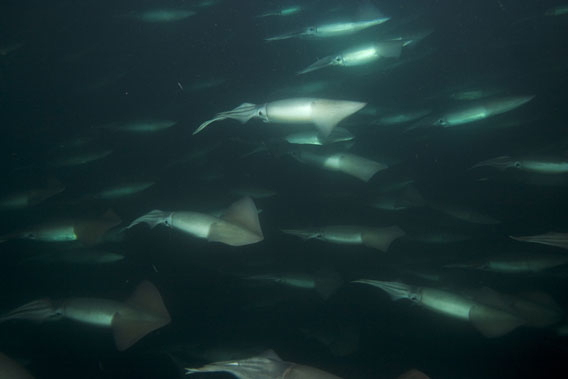 Great schools of Humboldt squid were spotted this week off the coasts of Los Angeles. Lately they have been reported as far north as Seattle, British Columbia, and even Alaska. Scientists speculate that the squid are moving north in response to overfishing and climate change. It also seems that the acidification of the ocean is changing their metabolism and driving them to more shallow water (which allows for greater oxygen uptake). 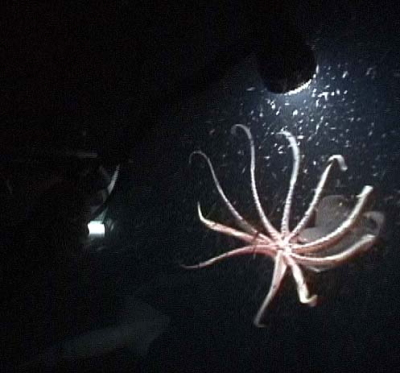 Humboldt squid can grow up to 1.5 meters (4.9 feet) in length and weigh as much as 50 kilograms (100 pounds). They have eight swimming/grasping arms and two long lightning-fast hunting arms lined with toothed suckers. The squid assemble in great schools of up to 1,200 individuals. They communicate through bioluminescence and rapidly changing body color. 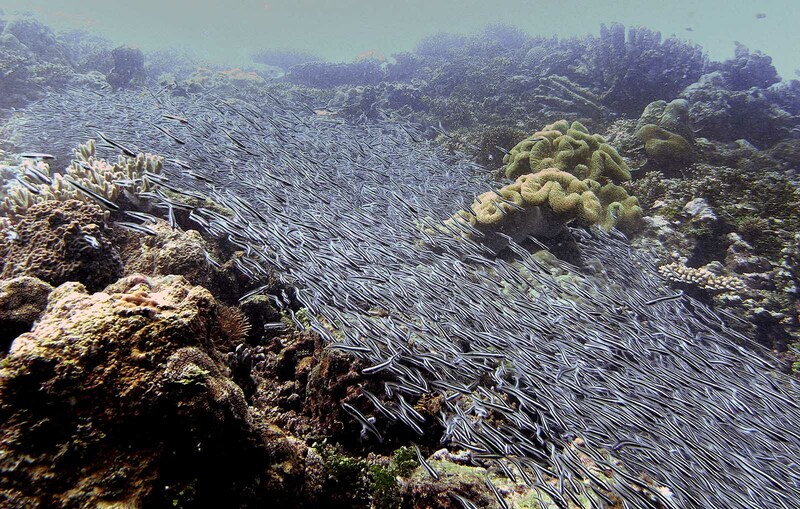 They are capable of group hunting—which makes a large school into a 50 ton super monster with ten thousand arms. The squid feed opportunistically on everything they can catch including fish, crustaceans, and other cephalopods (sometimes including each other). Oh, also they have large razor sharp beaks and are surprisingly intelligent. 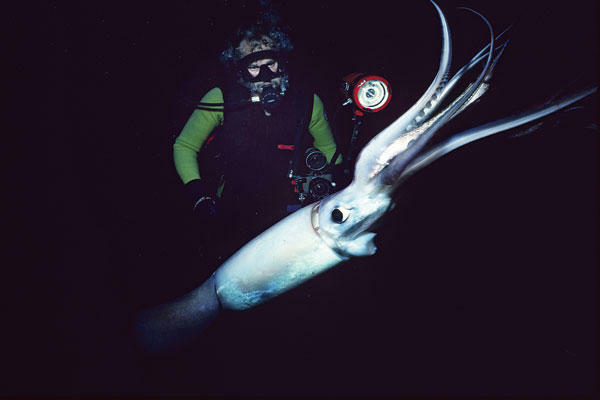 Humboldt squid have been known to attack divers (which can be a problem because of their size, spped, and sharp toothed suction cups) on the other hand they are said to be tasty is prepared correctly. 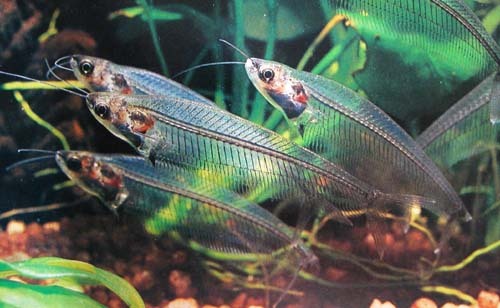 The most transparent known vertebrates are the Asian glass catfish of the genus Kryptopterus. The two most popular species are Kryptopterus minor, the ghost catfish, and Kryptopterus bicirrhis, commonly known as the glass catfish, which is a mainstay in the tropical aquarium. Asian glass catfishes live in slow turbid streams throughout Thailand, Malaysia and Indonesia. They are schooling predators who feed on tiny arthropods, worms, and minnow fry. Camaraderie is important for the little fish—outside of a school, individuals rarely survive (even in an aquarium where all of their other needs are met and they lack predators). Their remarkable transparency serves as camouflage, hiding them from predator and prey alike. Growing to a maximum of four inches the catfish live for up to eight years. Asian glass catfish are scaleless and lack pigment, however the cellular dynamics of their transparent tissues are still not fully understood. In living specimens, the animal’s skeleton is quite visible and its internal organs can be seen with a silver sack. A viewer with a powerful magnifying glass can watch the fish’s heartbeat and determine the contents of its stomach. When the catfish dies so does its transparency–after death they turn an opaque white. The catfish is commercially important for the aquarium trade. It seems possible that exporters in South East Asia have devised a way to breed the fish en masse, but, if so, it is wholly unknown in the west. 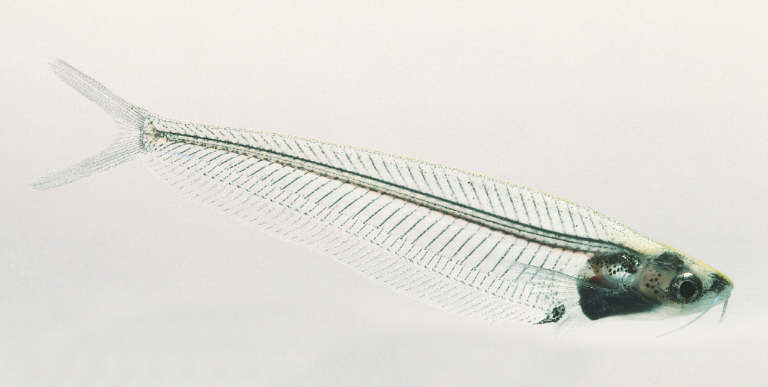 The Phantom Glass Catfish is also a major ingredient of some of the salty fish sauces used in Malaysian and Indonesian cooking. 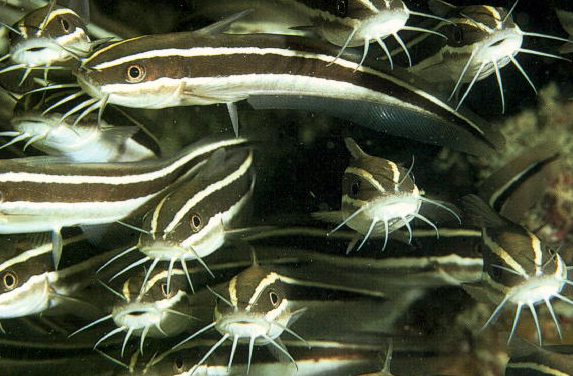 The Striped eel catfish (Plotosus lineatus) lives in the reefs of the Indo-Pacific ranging from the Red Sea to Australia up to Japan. The Plotosus genus of catfish are notable for abandoning freshwater (where catfish evolved and where the majority of catfishes live) in favor of the oceans. Plotosus lineatus is entirely oceanic: the species makes its home in the colorful and dangerous world of the coral reef. 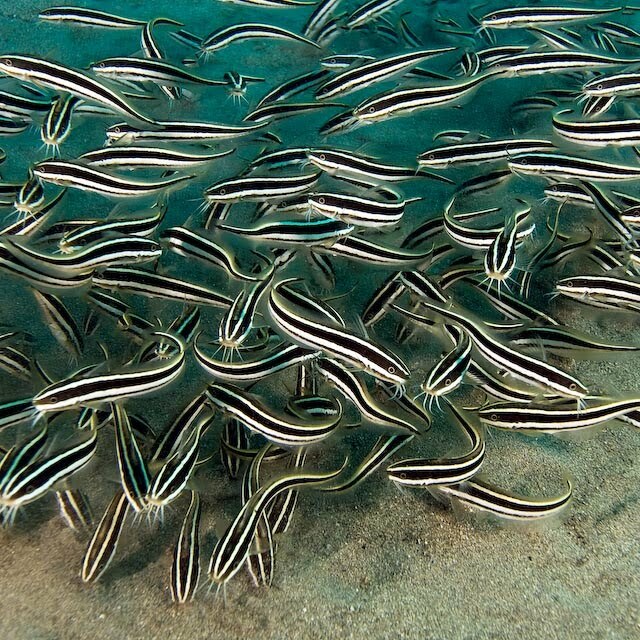 Young Striped eel catfish live in schools which can be composed of hundreds of fish however older individuals lose their schooling instinct. The catfish grub through the sand for tiny invertebrates, shrimp, and minnows. They possess electrosensory organs which allow them to sense the prey’s nervous system beneath the sand. Although they are very endearing walking along the sand on their little whiskers, you should not pick them up! These catfish have venomous spines on both sides of their body. The poison is acutely painful but not always lethal for adult humans.